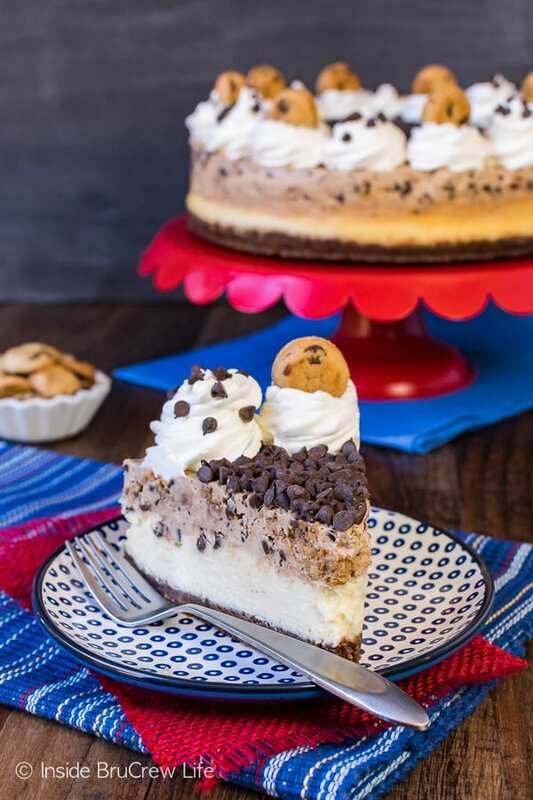 You are going to love all the layers in this Chocolate Chip Cookie Mousse Cheesecake. 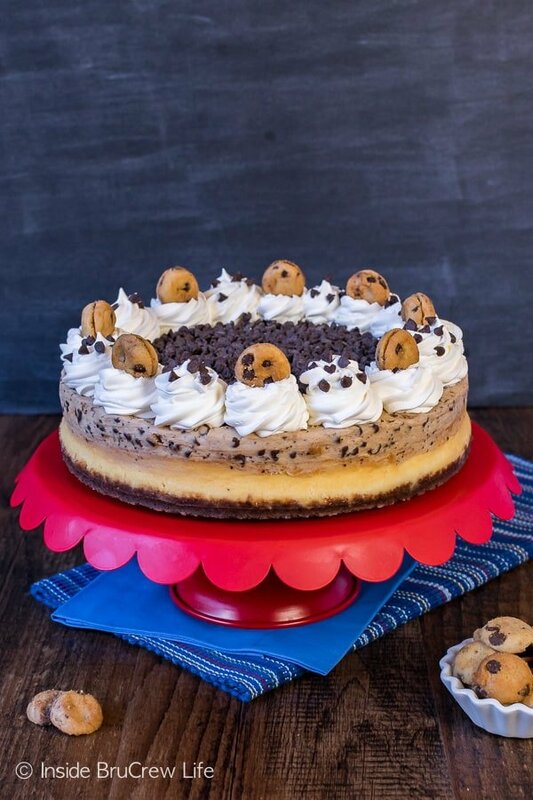 Chunks of cookies and chocolate chips in every bite make this a must make dessert. You guys! 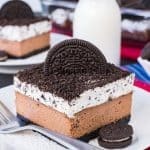 I haven’t even begun to put a dent in all the cheesecake ideas that I have swirling in my head. And that’s after writing Cheesecake Love. 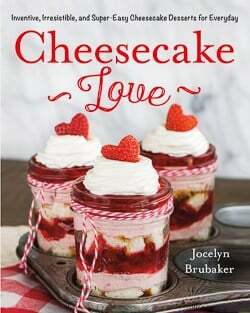 There are 75 cheesecake ideas in the cookbook, and I probably have another 75 ideas still waiting to be made. Maybe more. A friend of mine suggested that book number 2 might need to happen since I had so many more ideas. Or I could just start making a new cheesecake every week and share it right here on the blog. That sounds like a much easier idea. Since it took about 3 years from start to finish in the cookbook process, I’m not really interested in doing another one…now. Of course, that could all change if the right offer came along. This fun layered creation that you see right here is one of those ideas that just didn’t make it into the book. Certain ones had to be cut because I had way too many ideas to fit in one book. Aren’t you glad for that? 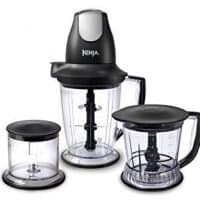 Now you get the pictures and recipe without having to leave your house. 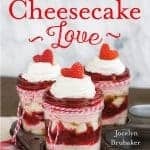 Of course, I do recommend getting your own copy of the cookbook because there are so many great new cheesecakes you need to make. 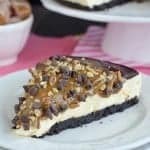 This cheesecake apple pie and this hot chocolate cheesecake dip are a few of the most popular ones that made it into the book too. 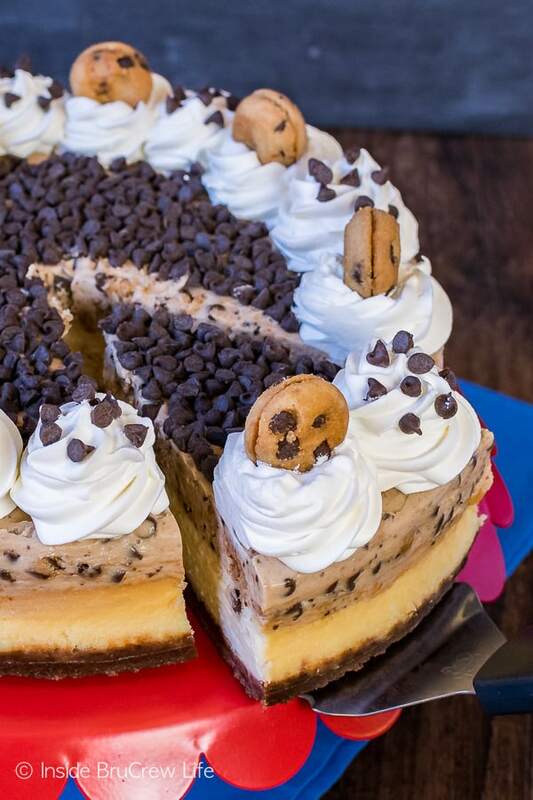 Let’s talk about each of the layers in this cheesecake that is staring you down. 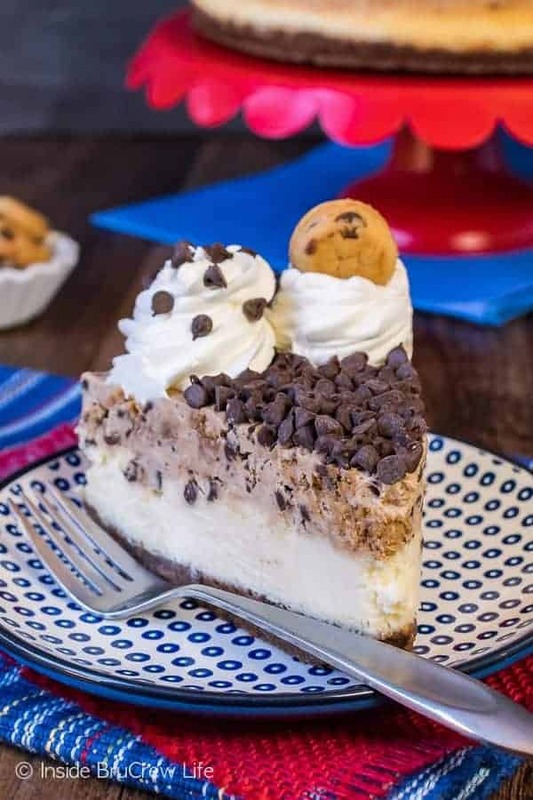 Crushed chocolate chip cookies and butter make up the crust on this chocolate chip cookie mousse cheesecake. It’s basically the best thing ever. 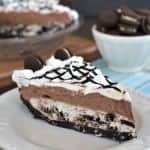 I think I like it even more than a regular Oreo crust. At least for this particular cheesecake. 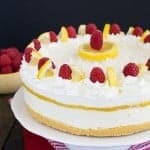 The cheesecake layer in this one has melted white chocolate in it. It bakes up so creamy and delicious. Cream cheese, sugar, and Cool Whip make up the top layer. 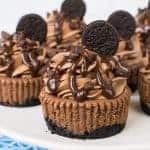 It creates a light fluffy mousse that is so good. To make it even better, I added crushed cookies, chopped cookies, and mini chocolate chips. Yup, it’s just as good as it sounds. Actually it’s better when you are digging in with a fork. And to finish the cheesecake off, I swirled more Cool Whip on top with mini cookies and added another layer of mini chocolate chips. That’s four layers of amazing cheesecake goodness. Preheat the oven to 350 degrees. 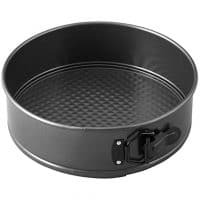 Line a 9 inch springform pan with parchment paper. Crush 30 of the cookies into crumbs. Mix with the melted butter and press evenly into the bottom of the prepared pan. Beat the cream cheese and sugars until creamy. Add the sour cream and vanilla and beat again. Melt the white chocolate according to the package direction and beat in the melted chocolate and flour. Add the eggs one at a time, beating after each one. Pour onto the prepared crust and bake for 45 minutes. Remove and let cool 5 minutes. Run a knife around the edge of the cheesecake to loosen it from the pan. Cool for 1 hour and then refrigerate for 4-6 hours or until completely chilled. Beat the remaining cream cheese, sugar, and vanilla until creamy. Stir in 2 cups of Cool Whip gently. Crush another 11 cookies to make 1 cup of crumbs. Stir into the mousse. Coarsly chop the remaining 7 cookies and add them along with 3/4 cup of the chocolate chips. Spoon on top of the cooled cheesecake and spread out evenly. Swirl Cool Whip around the edges of the cheesecake. 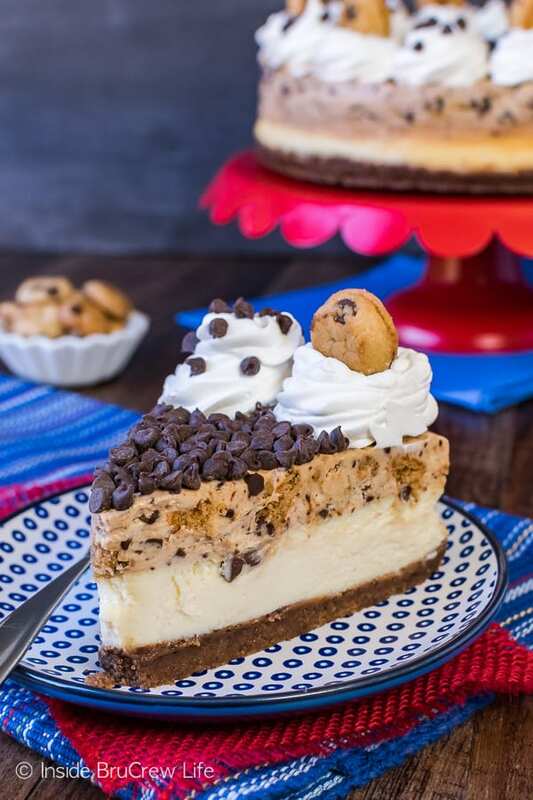 Sprinkle the remaining chocolate chips in the center of the cheesecake. 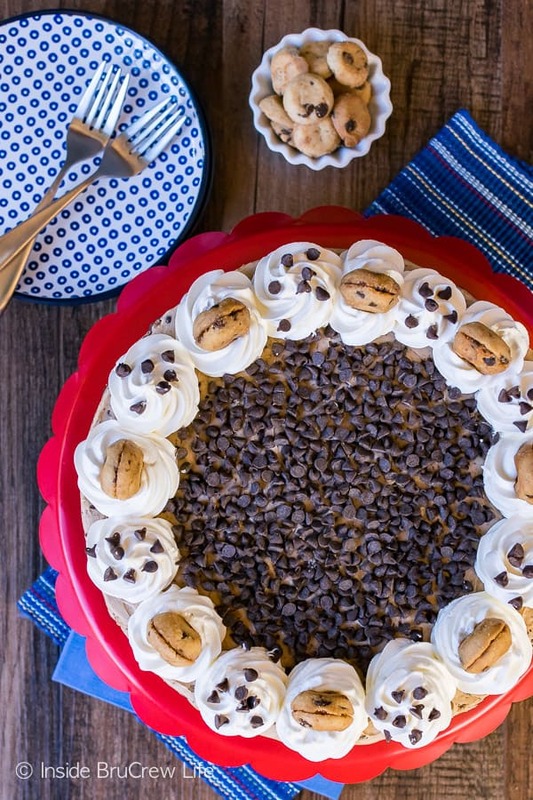 Top the Cool Whip swirls with mini Chips Ahoy cookies. 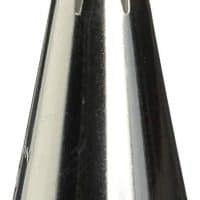 *This post contains an affiliate link. 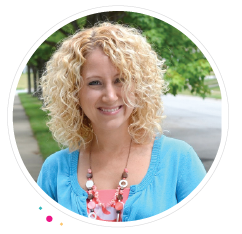 Inside BruCrew Life may receive a very small percentage from sales made through these links. As always, these links do not cost you any extra. Thank you for letting us share products with you this way. I can’t get Cool Whip where I live. Would heavy cream whipped up do as well? If so, how much cream should I use?